The Lander Blue Turquoise mine was a small mine that was located in Lander County Nevada, USA between Battle Mountain and Tenabo. This small "hat mine" produced some of the finest natural Spiderweb Turquoise to ever come out of the ground in the United States as well as around the world. 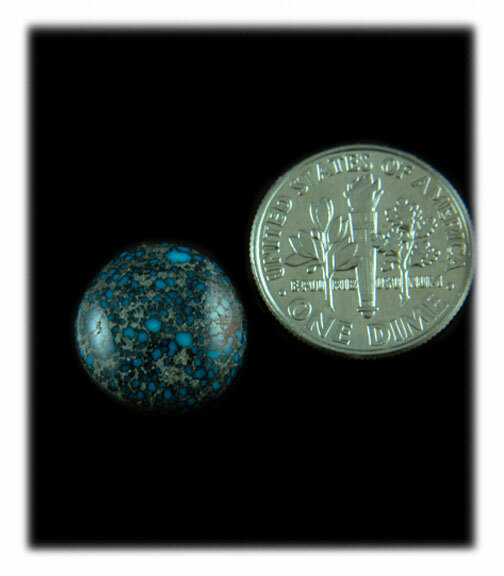 Lander Blue Spiderweb Turquoise Cabochons bring the highest price of any Turquoise cabochons in the world. Lander Blue Turquoise cabs can bring as much as $300.00 per carat (written in 2014). As you can see in the Lander Blue Spiderweb Turquoise Cabochons above the Lander Blue mine produced deep blue to "Robin's Egg" blue Turquoise with beautiful stark black spiderweb with some brown matrix chunks in the black web on occasion. The stones above are considered to be top gem grade. We have shown different shades of blue as well as different sizes of spiderweb matrix all are ultra high grade. Lander Blue was one of the few mines in the world that produced Turquoise that was almost gel or has a semi translucent glassy quality to it. Many people collect the finest web from the Lander Blue Turquoise mine. We will demonstrate this look of Lander Blue Spiderweb Turquoise cabochons below. Above to the left is a handmade 14k yellow gold ring by Nattarika Hartman with top grade natural Lander Blue Turquoise from Nevada, USA. This stone is a great example of genuine Lander Blue Turquoise with predominantly brown matrix with fine black spiderweb matrix in between. Above to the right is a Lander Blue Spiderweb Turquoise cabochon with "finger print" or "telltale" classic tight black spiderweb matrix and deep blue Turquoise color that collectors expect as classic Lander Blue Turquoise or "Lander's" as most call it. Above to the left is another look of natural Lander Blue Turquoise with a wider webbed matrix pattern. The blue in this stone is outstanding, but the matrix is a not as desirable to collectors as it is unevenly balanced. 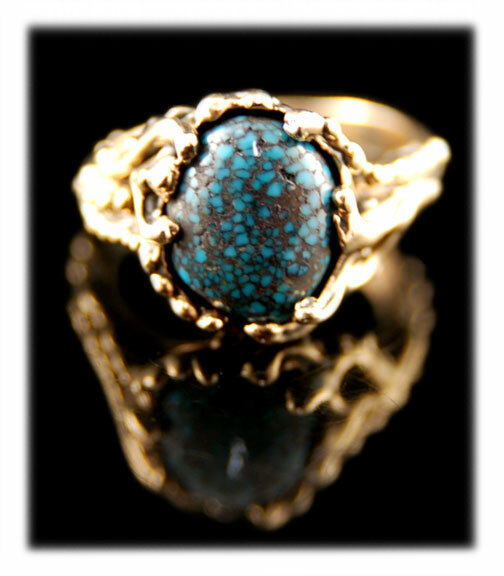 The matrix patterning and balance in this stone makes it a less grade of natural Turquoise from the Lander Blue mine. 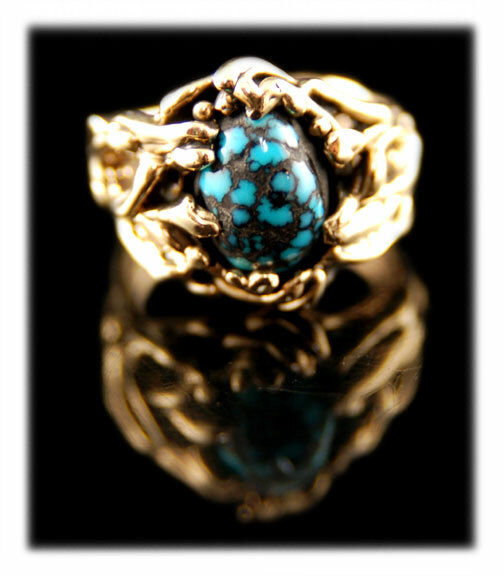 Above to the right is a handmade 14k gold ring by Nattarika Hartman with a wide web natural Lander Blue Spiderweb Turquoise Cabochon from Nevada. Above to the left is some of the rarest and most desirable natural Lander Blue Turquoise. These natural Lander Blue Spiderweb Turquoise Cabochons features the classic "finger print" or "telltale" tight spiderweb matrix and deep blue Turquoise combo that most collectors think of when they think of Lander's Turquoise. This spiderwebbing is so tight the stones look black with dark blue polka dots. This look of spiderweb is the rarest. 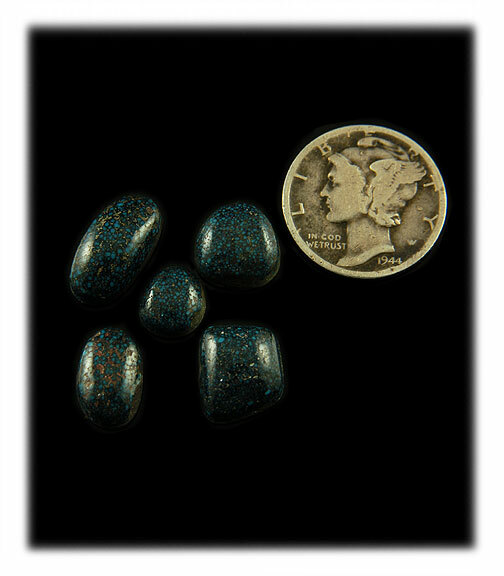 These stones are very obviously genuine Lander Blue Turquoise from Nevada. Most imitation Lander's does not have this look, it is rare to find this look from other mines. 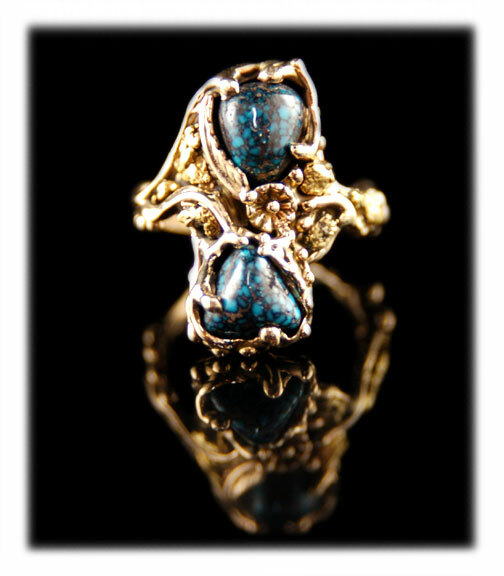 Above to the right is a two stone 14k yellow gold ring by John Hartman with genuine Lander Blue Turquoise. These stones are ultra high grade. Classic Lander Blue Spiderweb Turquoise! The Lander Blue Turquoise mine in Lander County, Nevada is located between Battle Mountain and Tenabo. The mine was first claimed in 1973. 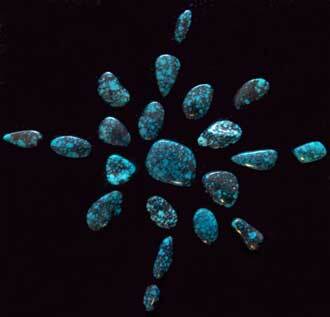 This little mine produced some of the most beautiful spiderweb Turquoise ever discovered. Today it is considered the most valuable Turquoise on earth. Not surprisingly, as early as 1975 it had been stated that Lander Blue had become some of the most valuable Turquoise to date. Like a number of the other high-grade Turquoise finds, Lander Blue was a very rich pocket discovery, and has been referred to as a “hat mine,” a term used to described small floats of Turquoise because they could be “covered with a hat” and exaggerated figure of speech There were no extensive zones or long veins. These pockets are not uncommon in nature and once mined out they are gone forever. The Lander Blue mine produce almost entirely spiderweb Turquoise cabochons once cut with colors from medium to deep blue with a stark black matrix. Although some other grades were found only approximately 100 pounds of the beautiful spiderweb Turquoise was mined at the location. Rita Hapgood, a one time blackjack dealer in Battle Mountain, while walking with her two sisters, found little nuggets on the ground along Indian Creek in the Crescent Valley area of Nevada. 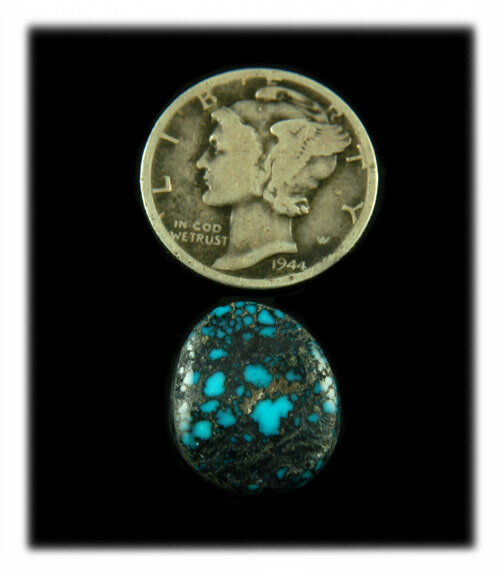 After discovering this deposit of high-grade Turquoise she went on to claim the site as the Mary Louise Lode Mining Claim, the name Mary Louise belonging to her mother. The mine bordered the Lander Ranch. Later the claim was sold to Marvin Syme and Henry 'Hank' Dorian for the sum of $10,000.00. They brought in Bob Johnson, who provided equipment and began working the claim. The three then named the company the Lander Blue Turquoise Corp.
Marvin Syme ended up owning a number of Turquoise mines in Nevada and later retired to Idaho. Hank Dorian operated the Nevada Club in Battle Mountain for a number of years until his passing and Bob and Dixie Johnson continued to sell Lander Blue Spiderweb Turquoise Cabochons until they ran out. The Lander Blue mine later became part of Dowell Ward’s large string of Turquoise mines. Today, because of its rarity and value, there seems to be more Lander Blue for sale than was ever mined. With very little provenance available when buying beautiful Lander Blue Spiderweb Turquoise Cabochons or Lander Blue Turquoise Jewelry, this material has truly become a case of ”Buyer Beware.” The only way to be sure is to buy from a reputable dealer and know what you are looking at. To the trained eye, nothing looks like true Lander Blue Turquoise. Thank you for reading about Lander Blue Turquoise and Lander Blue Spiderweb Turquoise Cabochons.